If going to college is a priority for you, financial aid should be important. With the rising cost of attending a secondary institution, there is also a growing need for financial aid. A vast majority of students today receive some type of financial aid. There are many different types of financial aid out there and here are a few of the most popular types. Student loans are the most common form of financial aid available. Student loans represent money that has to be paid back with interest. Even those that receive other forms of free financial aid, usually have to bridge the gap with loans. Therefore, almost all college students have some form of student loan by the time they are done. Here are the two most common types of loans. Government loans- Government loans represent the most common type of student loan. These loans are issued by the government and they all have the common trait of low interest. When you get a government-backed student loan, you are taking advantage of one of the most reasonable types of loans on the market. With a subsidized government loan, you can even get the government to pay for the interest on the loan while you are in school. These types of loans are only available to those with unfavorable financial situations. With an unsubsidized loan, you are responsible for the interest on the loan while you are in school. You can choose to defer the payments until you are out of school. Private loans- Private lenders make up the difference for the rest of the loans offered in the marketplace. Some students do not qualify for government loans for one reason or another and they have to look at private financiers for the money. When you get a private loan, you will typically pay a higher interest rate than you would with a government loan. Grants basically amount to free money. The government is responsible for grant money being distributed. These grants are usually reserved for those in negative financial situations. You have to apply for the grants and meet certain qualifications. However, if you are lucky enough to qualify, you do not have to repay the money at any point. You may have to meet certain requirements, such as maintaining a certain GPA while you are in school. 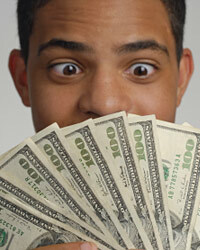 Scholarships are a source of free money that can be awarded by a number of different entities. The colleges themselves offer a high number of scholarships in the way of academic and athletic scholarships. If you excel in high school at athletics or academics, you could be asked to continue your endeavors at a university with the help of a scholarship. With scholarships, you also have to meet certain requirements while you are in school. The money from scholarships also does not have to be repaid at any point.